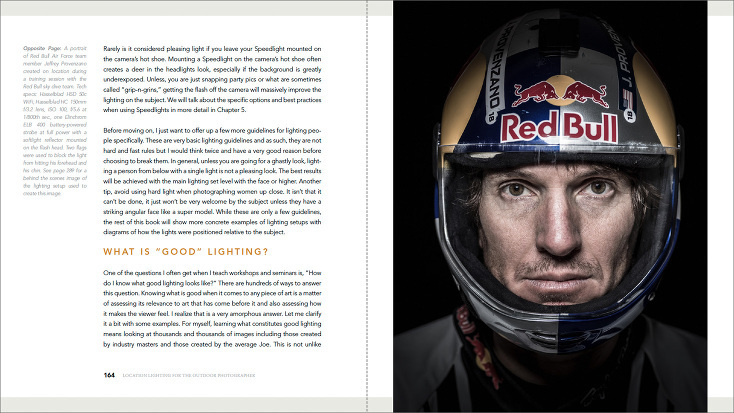 This is an excerpt from Chapter 2 of my recently updated e-book Location Lighting for the Outdoor Photographer. 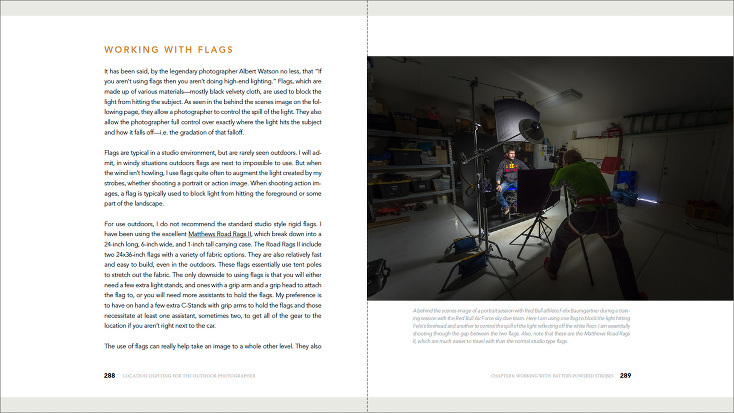 The updated e-book is 361-pages and covers location lighting from start to finish. It starts out with a comprehensive chapter on equipment and ends with an in-depth chapter on the most advanced lighting techniques available today. For more information about Location Lighting for the Outdoor Photographer and to purchase a copy please visit my website. One of the questions I often get when I teach workshops and seminars is, “How do I know what good lighting looks like?” There are hundreds of ways to answer this question. Knowing what is good when it comes to any piece of art is a matter of assessing its relevance to art that has come before it and also assessing how it makes the viewer feel. I realize that is a very amorphous answer. Let me clarify it a bit with some examples. For myself, learning what constitutes good lighting means looking at thousands and thousands of images including those created by industry masters and those created by the average Joe. This is not unlike learning what makes a great photograph. Master photographers are considered masters for a reason, just as “classic” novels are considered classic for a reason. Whether or not said master photographer’s work inspires me is unimportant, it was deemed important enough in the context of photography to elevate those images to a certain status and as such there is a lot to be learned by analyzing that work and how it was created. Hence, my answer is to look around you. Look at those photographers whose work you enjoy and are inspired by, also look at all types of art, and figure out what you like and how you can implement that inspiration into your own work. Portrait photography in particular is an interesting example. There are a lot of standard rules for lighting a portrait—to the point that it can become fairly formulaic. Just as with photography, or any other art form, you need to learn those rules before you can knowingly break them successfully. Learning “good” lighting techniques therefore involves a lot of research, a fair bit of experimentation on your own and a process of discovery that not only informs your skills but also your taste. To that end, I highly recommend buying a variety of fine art photography books, or checking them out at your local library, and taking in as much as you can. Alternately, tracking down a wide variety of “master” photographers online and spending significant time studying their work is also extremely valuable. I personally prefer books for this exercise as that allows me a lot of time to sit with the images and assess them in a much higher quality format. On my bookshelf, I have a wide variety of books from photographers and painters alike. Among those are photography books by Brassaï, Helmut Newton, Ansel Adams, Sebastião Salgado, Steve McCurry, Dan Winters, Annie Leibovitz, Albert Watson, Howard Schatz, Platon, Andrew Eccles, Marco Grab, Gregory Heisler, Jay Maisel, and Galen Rowell among many others. I also have a wide variety of art books covering artists like Dali, Picasso, Van Gogh, Leonardo da Vinci, Michaelangelo, Monet, Andy Warhol, Matisse, Degas, Georgia O’Keefe and on and on. In addition, I have hundreds and hundreds of my peers websites book marked and I often look to see what new work they have produced. I am constantly looking at photography, art and cinema for inspiration and to further my own understanding of the craft. Taking in as much as possible will not only improve your lighting, but also your photography. The more experience you have using strobes, Speedlights or any artificial lighting tools, the more you will be able to glean from looking at other photographers work. With experience, you will be able to better analyze how an image was created, how it was lit, and even to some degree how it was processed after the fact, which is a significant factor in this digital age. As with any subject, intensive study will lead to improved understanding, which will help improve your own skills and inform the final image. Excellent lighting takes time. Unless it is a set up that a photographer has worked with often, no matter what type of lighting used, it slows you down—and that is generally a good thing as it makes you think. Using artificial lighting, of any sort, is one big giant experiment and time is required to dial it in. Often, when experimenting, you don’t fully know what the results will be or what you are looking for but by continually experimenting and pushing your skills you will find new methods and new looks. Photography is an ever evolving art form. With new technology, new options are available to the photographer that have never been possible before. That creates opportunities to push the art form to a new place. I also want to emphasize here that learning to use artificial lighting is a process. You won’t learn it all here in this book by any means. Learning to use artificial lighting is going to take many years, and the learning process never ends. The lighting masters became masters because they spent decades learning how to tame their lighting. This book will most likely accelerate your skill level but really learning actual techniques can only be accomplished by doing and practicing.